INTERVIEW: Professor. S. Ratnajeevan H. Hoole has been appointed Vice Chancellor of the University of Jaffna. However a massive protest surfaced at the Jaffna University over his assumption of duties as Vice Chancellor. Prof. Hoole expresses his views to the Daily News on the current crisis at the Jaffna University in this regard. Q: How do you see the crisis situation at the University of Jaffna over your appointment as Vice Chancellor ? A: It is a severe crisis without any basis. I was appointed by the Council legally. However, a small group of people instigated by some who aspired to be Vice Chancellor are behind this issue. Q: What made you to go for the post of Vice Chancellor of the University of Jaffna ? A: I have a higher doctorate in addition to my doctorate. I have wider experience working in several countries-Singapore, Nigeria, United Kingdom, Canada and several years in the US, with twenty years altogether abroad serving in various capacities. 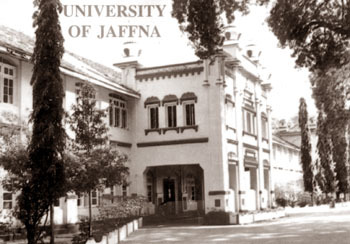 The University of Jaffna has lacked an engineering faculty, from its inception and its a professional field where a fewer universities have that faculty. So my intention is starting an engineering faculty for the University of Jaffna, because I am from Jaffna. I have a commitment to that region of the country. Q: What is your assessment over the functions of the Jaffna University currently ? A: It needs leadership at all levels. The students are being misled very badly. Those who are talented should either keep quiet or run away. And those who have ambitions without abilities to match are aspiring to high office and that is the crisis. The problems have been created by the non-academic staff unions and a few extremists among the students who have been misled by those who are using them to gain their own ends. Q: Why did you take the decision of making Professor Parameswaran the Vice Chancellor of the Jaffna University temporarily ? A: I was duly appointed. When I tried to go to Jaffna there were several threats. Some even in public. The student leader by the name of Vijaya Ruben made an announcement over the television, that he would take tough action If I enter the campus premises. There were calls to my home saying that I have to face the same fate faced by Rajini Thiranagama. My wife was warned over the phone that If I came to Jaffna I would return to Colombo in a coffin beheaded. My fourteen year old daughter was told over the phone, that if I came to Jaffna they would chop up her younger brother. In these circumstances it was impossible for me to go and I felt there would be more chaos. As Vice Chancellor it was my duty to ensure that there should be some order and Professor Parameswaran is one of the most senior Professors there and a very responsible man, widely accepted. I asked him whether he would carry on my duties as acting Deputy Vice Chancellor? A Deputy Vice Chancellor acts in place of the Vice Chancellor when the Vice Chancellor is not there and Professor Parameswaran readily agreed. At Vavuniya campus of Jaffna University I appointed Dr. Rajendra as its Rector. Immediately an attack was launched on him by Nitharshanam television in Killinochchi saying that Dr. Rajendra has a son who did some horrible things. Rajendra has no son like that. So anybody who associated with me and supported me have been threatened and attacked without any basis. It is sad. Jaffna is a seat of Tamil culture and a few people are blackening the entire community by this sort of action. Q: How closer is your interaction with the academic staff and the students of the University of Jaffna ? A: With the staff extensively: Being a member of the University Grants Commission I associated closely with them. They are very supportive of my appointment as Vice Chancellor. The students actually went and asked the University Teachers Association of Jaffna to support their so called struggle. So the UTA held a meeting and refused to do that. Senior Professor of History Sittambalam's house was stoned as he spoke in my favour and his nameboard as Senior Professor of History at the campus was broken up. There is basically no respect for the democratic process. I was elected by the Council. Council members are being attacked now. Q: What are your comments on your fellow contestants for the post of Vice Chancellor of the University of Jaffna? A: I had a lot of respect for them until I saw them working behind all these agitations. It's highly disappointing to see the senior academics behaving in a mean way. One of them was going around saying that he was most popular in the campus and he should be appointed as the VC. They have let down the academic community very badly. Academic learning should go hand in hand with culture. What we have is technical learning without culture. So it is a disease, which needs urgent attention. Q: Being a leading academic, what's your observation on the current political scenario in the North and East ? A: The Government needs to solve the problems of the Tamils very quickly. Otherwise there will be chaos. I am very saddened that there is no consensus in the South towards giving the rights of the Tamils. The biggest problem as far as the Tamils are concerned is migration-The brain drain. The people who are left behind are the least able to look after themselves. The Sinhalese need to understand that putting down a rebellion by force is counter-productive. The only way to address a rebellion is to provide the just demands. I think federalism is a just demand. I don't think any sane person can contest that. Q: Do you think that if you assume duties as Vice Chancellor of the Jaffna University you could handle the job in the backdrop of the various activities of the LTTE in the North? A: I have assumed duties. My goal is to build up the University and I believe the LTTE in need of that. So I do not see any contradiction there. Whatever the problems, with regard to the University, should be solved amicably without giving room for any clashes. When the students agitate, it should be handled wisely instead of using any force. Sir Ivor Jennings was very clear in his book that when students do mischievous things just look the other way. But in my case threatening to kill a Vice Chancellor is something very serious. Q: As a man from Jaffna how do you recollect your student days compared to the present situation in the region ? A: My student days were the happiest days in my life. I am from Nallur CMS practising school, which is a vernacular school and frequently at St John's College, Jaffna. I entered the University of Peradeniya and belonged to the first standardisation batch. At that time they said, that there were too many Tamils at Peradeniya and transferred half of us to Moratuwa and I graduated from the University of Moratuwa. I have my higher doctorate-Doctor of Science and I think that it's the schools and the home that made me and not the university here. Now I am very sad that the people of Jaffna do not have that opportunity today. The student community in Jaffna needs a wider learning not just the technical learning. So the students of the Jaffna University are being denied the wider learning by the forces that are obstructing them. The people of Jaffna have been deprived of the services of good teachers by the war and that has to be urgently rectified. Q: The University of Jaffna has completed more than thirty years. What is your assessment of its overall functions so far ? A: It was one of the best national universities up to the late seventies. However, it collapsed because of the war. And the Tamil students have been deprived of having a good constructive university. Now the good Tamil children, good in the technical sense, are forced into the University of Jaffna, because they are from Jaffna, although those who have performed less well are sent to Peradeniya, Colombo and Moratuwa, which are more capable of giving good education, simply because of this geographic proximity rule. That is why there is a lot to do in the University of Jaffna to have good teachers and good opportunities for students.